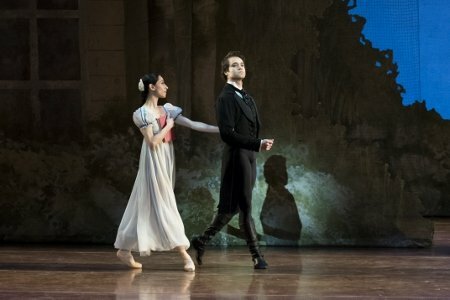 Having seen all four casts of the Boston Ballet production of Onegin by John Cranko, I feel compelled to give some recognition to the performance that moved me most. It starred Erica Cornejo as Tatiana and Paulo Arrais as Onegin. A few years ago I saw Cornejo as Carabosse in The Sleeping Beauty, and I thought it was the best interpretation by a female I had ever seen. Because of that performance, I had high hopes for her Tatiana, but I was not prepared for what she put onstage. Almost from the first moment she appeared, Cornejo seemed different from the other ballerinas I had seen in the role: she was extremely serious, bookish, and intelligent, but also so fragile and vulnerable that it broke one’s heart just to look at her. The whole disaster that she was about to experience was written on her face, and in this she reminded me of Larissa Ponomarenko in the starring role of Cranko’s Romeo and Juliet. At the end of Act I, when Ponomarenko held the ball gown up to her chest and looked out at the audience, it was clear that her fate was sealed. For both Tatiana and Juliet, there is no escape. During the Act I dream pas de deux, when Onegin appears to Tatiana by walking through a mirror, Cornejo’s face was incredibly radiant. Her belief in the man she imagined was so strong that one could only pity her even as one marveled at her commitment to the illusion she had created. When Onegin lifted Tatiana from a standing position and she arose from the earth like Botticelli’s Venus, Cornejo seemed transfigured by ecstasy. As Tatiana soon learns, however, the real Onegin is the opposite of her dream lover. Cornejo’s technique was a marvel, with flips and turns taken at tremendous speed. In the Act I and III pas de deux with Onegin, the force with which she propelled herself into Arrais’s arms took one’s breath away. From that I learned that speed is essential to Cranko’s choreography. Without it, the quality of abandonment it’s designed to convey is attenuated. Cornejo was also wonderful in the Act III pas de deux with Prince Gremin, Tatiana’s husband. The expansiveness of both her port de bras and her positions in the long, slow, arching lifts expressed her love for him and her gratitude for the peace and tranquility he brought to her life. Arrais, who was cast against type, managed to match Cornejo in intensity and pathos. He is not a big man and he has a slightly boyish look. As he told me, he was thought of as more suited to the role of Lensky. Perhaps because he was not the obvious choice for Onegin, he seemed to have worked extra hard to motivate every moment, and it showed. I found his interpretation to be a triumph. Especially memorable was the way he presented the little Act I variation that Onegin does by way of introducing himself to Tatiana. I had wondered why Onegin bothers to pay her that kind of attention since he’s not interested in her. Arrais taught me the answer: he stepped out in front of Cornejo, did the steps, and then sort of shuddered before turning back to her. That shudder was Onegin’s awakening from a self-involved reverie so profound that he forgot Tatiana even existed and had to take a moment to remember where he was and with whom. This variation (there’s no equivalent in Tchaikovsky’s opera) seems like the inverse of a similar moment in La Boheme. When Rodolfo sings “Che gelida manina,” he starts by introducing himself to Mimi and ends by confessing his love for her. In Onegin what appears to be a compliment to Tatiana turns into an insult. Cornejo and Arrais put such tensions front and center. In their performance the ballet took on the extreme contrasts of grand opera: it was all naïveté and cynicism, passion and ennui, honor and disgrace, love and death. Arrais’s technique, like Cornejo’s, was wondrous. His lightning fast and perfectly landed double tours, the arch of his back (the choreography consistently features arches backward and forward as emblems of intense emotional states), his big jumps and positions in the air: all of it was precisely executed. I particularly appreciated Arrais’s demeanor during the Act I pas de deux. He smiled at Tatiana throughout as if he actually loved her, and since he was a figment of her imagination, that was not only appropriate but necessary. Not all the Onegins were as willing to embody Tatiana’s fantasy. If the dream pas de deux is about love, the last pas de deux is surely about death. In fact, after watching this performance I came to the conclusion that the final moments of the ballet recapitulate the duel. Tatiana’s gesture of dismissal, arm fully extended, is exactly that of the two duelists as they pointed their guns at each other. In effect, she shoots Onegin who, rushing offstage in obedience to her command, becomes dead to her forever. Tatiana’s final action is to clench her fists and, with elbows bent in front of her, slowly lower them in an agony of regret. This recalls Onegin’s anguished contemplation of his hands after he has killed his friend. 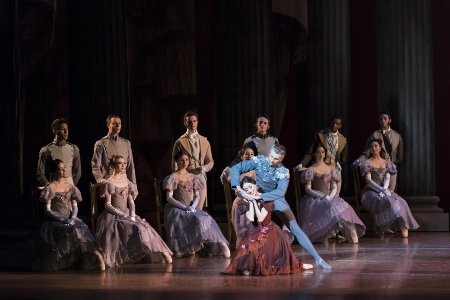 As they interpreted their roles, Cornejo and Arrais revealed nuances in Cranko’s choreography that I had not appreciated until I saw them realize his vision. It was an Onegin to remember. As many times as I have seen Cranko's "Onegin," I wish I could have experienced these performances with Cornejo.